First Wind is very familiar with the turbines selected for the Mars Hill project, GE's 1.5 MW units. With thousands of these turbines in use around the world, Michael Alvarez of First Wind describes them as "workhorses of the wind power industry." First Wind has recently completed the first large-scale wind power project in New England, the 42 MW Mars Hill wind farm in Maine, and is now moving on with another project in the state. It's clear that First Wind likes a challenge. The Massachusetts-based wind energy company has certainly taken on wind power projects that are far from the fairly straightforward process of constructing wind farms on the flat lands of the Midwest or Prairie states. These mid-sized projects range from building a wind farm on mountains in Hawaii to installing turbines on the site of a former steel mill in upper New York State. Rather than build large in the obvious wind resource-rich areas like Texas or elsewhere in the U.S. wind belt, First Wind chooses to go off the beaten track-and they tend to go medium size, rather than large, with projects. First Wind doesn't back away from projects that involve challenges, projects that might not even be on the radar screen of companies looking to do the quick-and-easy, large-scale wind farms. The company takes on wind farm projects in carefully considered ways, and as a result has been the first to do certain things. These firsts include the first large-scale project on Maui (Hawaii) and the first deployment of 2.5 megawatt (MW) Clipper "Liberty" turbines at its 20 MW Steel Winds project in Lackawanna, N.Y. The company tries to be progressive and break ground on innovative solutions to some of the problems facing the industry, notes Michael Alvarez, executive vice- president and chief operating officer of First Wind, and that brings its own returns. "Taking on these projects not only makes it an exciting place to work, but very rewarding." First Wind achieved another first recently when it built the first large-scale wind power project in New England, the 42 MW Mars Hill wind farm in Maine. First Wind began evaluating the Mars Hill site in northeastern Maine, near the border with Canada, in 2003. A series of studies indicated Mars Hill Mountain would be ideal for wind farm development, possessing a robust wind resource. Also working in favor of Mars Hill as a wind farm site is that it has already been developed, with the Big Rock ski resort. The International Appalachian Trail also runs through the mountain. "With the development that had already been done on Mars Hill, we weren't faced with the issue of disturbing a pristine environment," notes Alvarez. Maine is no different than other areas of the U.S., in that people generally don't like to have pristine areas that are highly valued developed-even if it is for a wind farm. "There was also community support for the project, which is always important, as well as state support. All those factors together suggested to us that the development potential for the Mars Hill site was particularly high." 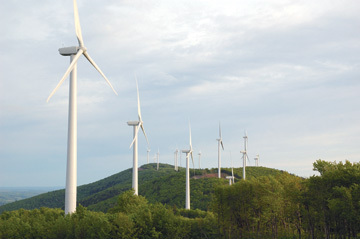 The community support was so high that the town of Mars Hill, in fact, was listed as a co-applicant for the wind farm. The benefits to the residents of the town of Mars Hill were said to include a significant drop in taxes, and that has since happened. With the project contributing $500,000 in taxes, the tax bills for residents have dropped by 20 percent. Getting local and state buy-in for a wind project is always important, regardless of where it is located in the United States. But New England, including Maine-in spite of being generally environmentally pro-active-has proven to be particularly challenging in terms of wind farm development. That could be viewed as just a bit contradictory historically, considering the world's first megawatt-size wind turbine was connected to the local electrical distribution system in Castleton, Vermont in 1941. 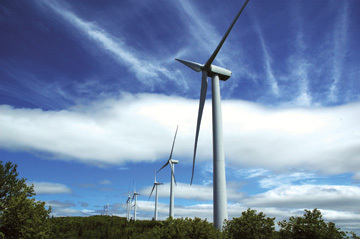 "Mars Hill is the largest wind farm in all of New England and the largest commercial project in Maine," notes Alvarez. "That does not mean that Maine is not receptive to wind farms conceptually-it certainly embraces them. But in large measure, they are trying to preserve the environment and are very proud of the environment." What that effectively means is that to move ahead with a wind farm project not only do you have to get local and state authorities on-side, but you also have to work with other constituencies and groups. In the case of Mars Hill that included everyone from Maine Audubon to the Natural Resources Council of Maine to, on a very local basis, the Big 13 ATV Club. First Wind patiently worked with all of these groups. "We did a fair amount of educating on what could be expected with a wind farm and what impacts it might have," says Alvarez. In general, he added, people were very receptive to this form of power generation. But the message First Wind received was that the project needed to be built and managed in a very careful, and respectful, way as regards the environment. Despite the difficulties other companies may have had in moving wind power projects forward in Maine, the review process itself does not appear to be any more onerous than many other U.S. states. The lead agency dealing with Mars Hill was the Department of Environmental Protection. Helping to keep the process moving along was a statutory permitting regulation that calls for a determination six months after the filing for a project. "In terms of time expectations, I think we were right about where we thought we would be for Mars Hill," says Alvarez. Protection would have required this of pretty well any wind project in Maine." Another consideration was the sound that the wind farm would produce. A consultant prepared a sound level propagation map for the DEP and the permit was predicated on meeting local sound regulations. "It's a process," notes Alvarez. "You identify the overall issues relevant to a site, and you do a lot of spade work to address those issues, including reaching out to the constituencies that are interested in those issues to get their feedback and input." UPC Wind has changed its name to First Wind. The new name more accurately captures the company's approach to developing, owning, and operating wind farms in key North American markets, the company says. "Although our name has changed, our core values remain the same," says Paul Gaynor, president and CEO of First Wind. "As First Wind, we remain committed to our community partners, to seeking energy independence, and to finding environmentally sensitive solutions to meet the nation's growing energy needs. We look forward to continuing to bring these values to the development, construction, and operation of our wind power projects under the First Wind brand." The name change will not have any impact on the company's organizational structure, day-to-day operations, nor the company's ownership. Once the go-ahead was given for the project, First Wind was able to benefit, to some degree, from the development that had already taken place on Mars Hill. With the ski hill on the mountain, as well as there being broadcast and cellular towers, there was a rudimentary road network in place. But First Wind had to carry out some substantial improvements to the existing road system so it could handle the heavy-and wide-loads of the towers and associated wind power equipment. "We had to build the roads and get access in a way that allowed us to bring in very large pieces of equipment-the towers are long, the blades are big and the nacelles are heavy." The 252-foot towers came in three sections, and the nacelles weigh in at 120,000 pounds. The components for the largest crane in the northeast-to erect all of this-also had to make the climb up a not insignificant New England mountain (Mars Hill has an elevation of 1,748 feet). On the site itself, they did some clearing and rock blasting. But all of the material that was excavated was utilized on the site, such as in the building and upgrading of roads. Alvarez summarized this work as not taking away material so much as moving it around to facilitate construction. "You need to take into account any considerations raised during the process and re-site some of the units accordingly," says Alvarez. "So we ended up with 28 units, rather than 36. They are reasonably close to the original layout on the ridge, but not in precisely the same places." Some of the re-siting was due to site geography, as well as adjustments made based on the results of the sound level studies. First Wind was the general contractor on the project, using its own in-house construction team to oversee Mars Hill. It subcontracted components out to local contractors. The engineering and project management was done by Perkins Engineering Inc., site civil work by Sargent Corporation and drilling and blasting by Maine Drilling and Blasting. Turbine foundations and erections were done by Reed & Reed Inc.
First Wind is very familiar with the turbines selected for the project, GE's 1.5 MW units. With thousands in use around the world, Alvarez describes them as "workhorses of the wind power industry." The activities onsite at Mars Hill proceeded pretty much seamlessly from the construction phase through to the operations phase, says Alvarez. "There was not necessarily one date or time when construction ended and the operations phase began-some turbines were finished earlier than others. But generally the turbines on the project went into commercial operation around the same time." And having managed construction, First Wind is now overseeing operations, following its business model of the "develop-to-own" concept. "Our whole business approach is that we're the developer, we're the builder and we're the operator for the full term of projects," Alvarez explains. "We hired an affiliate of GE to provide the initial operations and maintenance service for the turbines, which helps facilitate the enforcement of the warranty. But First Wind handles the balance of the plant maintenance." With the Mars Hill project completed, the company is now moving ahead with another project in Maine, Stetson Mountain. The 57 MW project, to also employ GE's 1.5 MW wind turbines, received approval from Maine's Land Use Regulation Commission this past January and construction has started. It's quite understandable that First Wind and other wind energy companies have an interest in further wind power projects in the state. While not at the top of the list, Maine is among the top 20 states for best wind energy potential and ranks highest in New England, according to the American Wind Energy Association. An interesting note is that the highest surface wind speed ever officially recorded in the U.S.-231 miles per hour-was in New England, at the Mount Washington (New Hampshire) Observatory in 1934, during a wild April storm. First Wind has a focus on the northeastern U.S., though the company also has projects elsewhere in the U.S. It is working on Vermont's first commercial scale wind farm, the 40 MW Sheffield wind farm, and has two other projects going ahead in upstate New York, with a combined capacity of 180 MW. The company also has a project going ahead in Utah.